Chicago Helicopter Tours is located at Chicago Executive Airport (PWK) formerly known as Palwaukee. We are located West of the airport on 1071 S Wolf Rd. in Hangar 10 / Bay 4 in Wheeling, IL. Get on I-190 E. Take I-294 N to Willow Rd in Glenview. Take the Willow Road exit from I-294 N.
Turn right onto S Wolf Rd. Chicago Helicopter Tours will be on the right at 1071 S. Wolf Rd. At Rosemont CTA Station get on bus 221 towards Wolf / Piper for about 45 minutes (80 stops). Get of at Wolf / Piper and walk north on S Wolf Rd. for about 12 minutes. 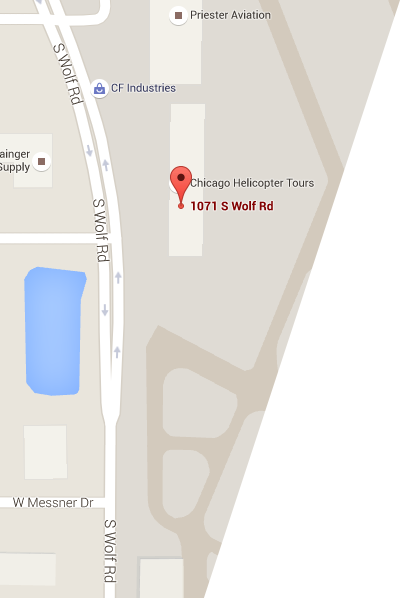 Chicago Helicopter Tours will be on the right at 1071 S. Wolf Rd. Use caution on S Wolf Rd.